Born November 1893, Died November 1914. "The hearts of all Hucknall people have gone out to Mr and Mrs Atkinson, G.N. station house, whose son, Leonard Hobster. was a wireless operator on the ill-fated Bulwark which now lies like a scrap of iron in Sheerness Harbour, due to the explosion which occured on board on November 26th. Over 700 were carried to their doom, the survivors onlynumbering 14. Strange to say, one of the survivors - Able Seaman Johnson - was a former schoolmate of Atkinson's at Louth, where the family is well-known, Mr Atkinson having held the position of chief goods clerk there on the Great Northern Railway. "Leonard Hobster Atkinson was born on November 8th, 1893, in South Lincs., and was thus just over 21 years of age. He entered the Royal Navy on May 9th 1909, and joined the Shotley Training Establishment the day the present King came to the throne. After three months he passed out of this establishment, gaining 100 per cent. marks and was sent to Devonport for advanced training, his choice falling upon wireless telagraphy. 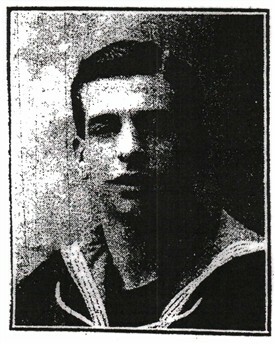 In May of the following year he was passed out into the Fleet, having gained second prize out of 50 lads for mechanical training and rated boy telegraphist. He joined the 'Venerable' in June 1910, one week before the Coronation Review, at which he was present. The Autumn of the same year was spent at Gibralter. At the commencement of 1911 he was drafted to the Hecla parent ship of the Fourth Destroyer Flotilla: then on June 5th he was sent to Chatham to join the 'Bulwark' on which ship he remained until his death. "During the time he was on the 'Bulwark' he was made ordinary telegraphist and telegraphist, and during the last two or three weeks had completed his examination as leading telegraphist: the result of this has not been made known. On his 21st birthday on the 8th of this month he gained his stripe for three years' men's service. "At the commencement of last week the 'Bulwark' was in action continuously an the Belgian coast a Zeebrugge &c., and had only returned to Sheerness for a further supply of ammunition when, after a few hours, the fatal accident occured. Thus he had done his little for his country, and has died the death of a true Briton. "On Sunday afternoon an impressive memorial service was held at the Hucknall Wesleyan Chapel, being conducted by the Rev. Mortimer Allen, whose soothing words were much appreciated by a large congregation. Miss Ford sang 'O Rest in the Lord' and appropriate hymns were sung".